Unmanaged Ethernet Switches : These industrial rated Switches are designed to be installed in both harsh climatic environments and noisy electrical installations. They are DIN Rail Mounting and have very wide ranges of DC Input and Operating Temperatures. 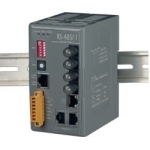 Real-Time Redundant Ethernet Switch : Minimum down time is essential for industrial Ethernet Networks. These range of Ethernet Products employ design techniques to provide high reliability of performance. Fibre Converter : The utilization of fibre optic data transmission for industrial automation and process control has become increasingly popular over the past decade. A basic fibre optic system, using an optical transceiver circuit and fibre optic media, offers a wide array of benefits in terms of bandwidth noise immunity and electrical isolation. Industrial Ethernet Ring Switches allow redundancy to be build into an Ethernet Network so that any failure of a copper or fibre link can be automatically re-routed. A Range of Industrial Ethernet Switches with integrated Fibre-Optic Port. To join ethernet networks, there are many advantages to using Fibre-optic technology. The range includes options for Single or 4 port ethernet, single or dual port fibre optic. These Unmanaged Industrial Ethernet Switches are designed to be used under harsh climatic environments and noisy electrical installations and provide an efficient method of networking Ethernet-based Data Acquisition Equipment and Sensors.